Come and get your slice of the good life at The Cliffs Valley, minutes from downtown Greenville, Asheville, and Hendersonville. This luxurious 3 bedroom 3.5 bath estate has great views of the lake and mountains. The very talented Bruce Aho and partner Jay Estola with A2E Builders are giving you the opportunity to build this dream home in a luxury living community. Michael Garrell is the gifted Architect and owner of Garrell & Associates home design. Spanning over 2,500 SF, this magnificent planed waterfront residence will charm you with an evoking rustic appeal. The welcoming facade in stone and rough sawn timbers is accented with arched windows and shutters. 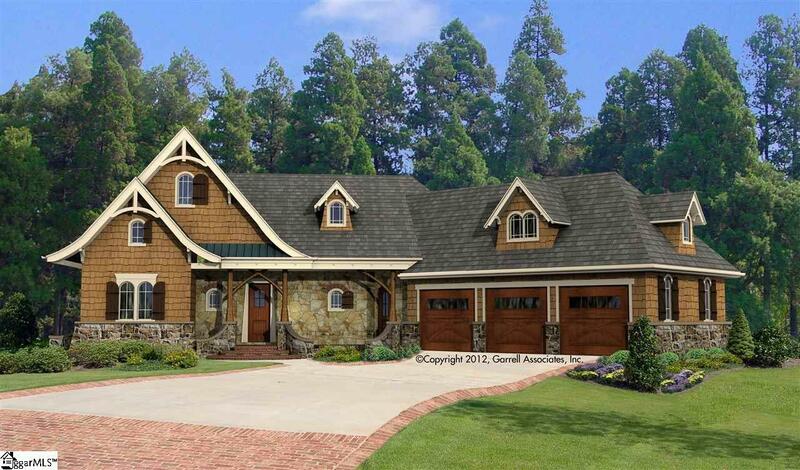 The open flowing floor plan boasts a private master suite with access to a covered porch. An optional second floor provides a spacious loft and storage area. The available terrace level has two additional bedroom suites and an expansive social area. Soaring ceilings and wall-to-wall windows are a haven for gazing at the gorgeous views of the SC mountains, and the lake. The grand entryway with a sweeping staircase draws you into a practical layout made for entertaining. The vaulted great room and dining room gives you access to the rear deck that has a dramatic focal point of the lake. The main level has an elegant formal dining room, tremendous chef's kitchen, den/family room with a stone fireplace and glass doors to the backyard, and outdoor living. The divine master suite presents a double tray ceilings, lots of windows, a private covered balcony overlooking the beauty of the Cliffs community. The exquisite bath and separate custom made shower will allow you to relax and leave your day-to-day stresses behind. Laundry is conveniently located on the main levels. The Cliffs Valley is a gated luxury community in the SC mountains that supports the healthy living and wellness lifestyle. This home is priced with the optional second floor and also includes the lot for purchase. (See Lot MLS #1356359) Amenities include wellness center, clubhouse, tennis courts, nature center, and a active cycling community. Oh, lets not forget the world-class golf that's home to the Ben Wright-designed, parkland-style golf course. Construction of this home will began soon, so contact me or your agent to discuss what features you want in your new home. Call me or your agent for details. Listing provided courtesy of Cheyenne Kozaily of Blackstream International Re.